Our view: In a nutshell, Yamaha MCR-040 equals to premium quality audio in a very compact package. It's not your common, toy-like iPod/iPhone dock which usually produces uninspiring bass and tinny sound. The Yamaha MCR-040 gives you warm, detailed sound and tight base which earns itself a place amongst the high quality names in audio industry. It is housed in a very compact shape made from composite and metal materials which reflects high quality workmanship. If size can be deceiving, the Yamaha MCR-040 certainly proves that. It easily fills a generously sized living room with decent volume without losing its detail and bass as you crank up the volume. With the extensive mix of colours available and the enormous range of connectivity options including iPod, CD and DAB+ radio, the MCR-040 delivers great sound, design and functionality at an affordable price. For those with a passion for music and fashion! The MCR-040 offers you the latest digital radio stations from around Australia. Not only does digital radio offer you new stations such as NovaNation, Koffee, and Radar, but your old favourites will have similar sound quality to that of a CD. We don’t know of a person who doesn’t own at least one iPod these days! So, we put an iPod dock right on top of the new MCR-040. Simply, drop your iPod in, press play and your away. You can change the volume from the remote included with the MCR-040 whilst your iPod is charged whilst you play your favourite tracks! We know you have amassed a sizeable CD collection over the years. Even with MP3’s all the rage, sometimes it is just easier to stick your favourite CD in and press play. The MCR-040 caters for every option, even CD. Drop some MP3 files on your USB stick and plug it into the MCR-040, press play and away you go. The MCR-040 keeps it easy when you want to listen to music! Using the front 3.5mm AUX input, you can run music from your computer straight into the MCR-040. Simply press play on your computer and turn up the volume to enjoy the music stored on your computer with everyone around you. Advanced YST is Yamaha’s exclusive technology which enables small speaker enclosures to reproduce levels of bass usually obtained from much larger cabinets – perfect for use in subwoofers. 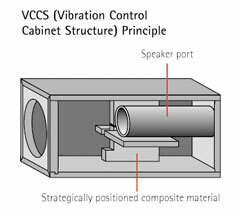 VCCS solves the problem of speaker cabinet vibration with strategically placed pieces of a composite material whose shapes, positions and angles were arrived at after a long process of experimentation. It also uses special foam rubber that provides excellent vibration isolation performance. Exeltek are Australia's leading provider of cheap home theatre systems. Check out our entire range of micro hi fi systems today!